Very nice. 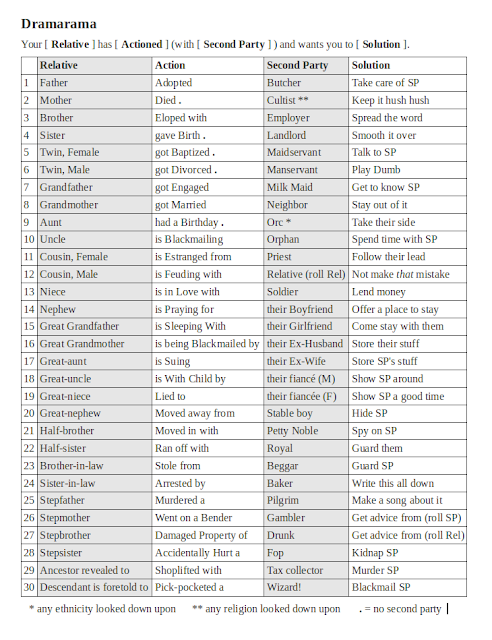 I always enjoy reading this sort of table, and it may prove to be useful at the table as well... if not for players, than for NPCs (say, in a court setting). Every player of a noble background should roll twice. I had a simpler version of this in my character generation sheet, and left it up to the players or myself at the table to come up with the various details. I love the idea of using it as a penalty for coming back into town. Instead of a town cost, you can provide a reward for solving the problem and/or a complication for not solving it. Depending on the situation. That's like family - there is a cost, but they aren't all downsides. Otherwise you might get a lot of CE Orphans in your games, or people who act like them. Oh, and I might roll regularly - so if you stay away from town for 3 months and come back, bamn, lots of stuff happened . . .
Hey thanks, all, I made it back only slightly scathed from upper suburbia. @Peter: That's the smarter way to do it: they deal with the family issue *before* they get the rumor. Thanks. Good idea. I like your posts about towns and NPCs. It's an area of the game that's often neglected, and I'm glad someone's producing good resources for it. How I might use this chart is have it only affect characters with certain backgrounds, as a trade-off for coming from a large or rich family. 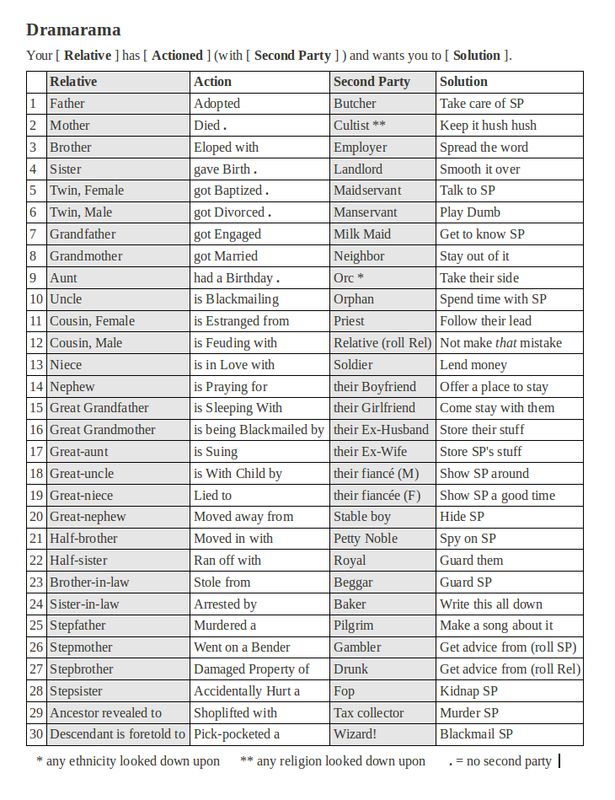 So a nobleman character could start with extra gold and family connections, but constantly get dragged into family drama, while a homeless wanderer would start with less resources but never have to roll on the chart. Thanks, Alonzo and that's a great idea-- tangible downside for the wealthy or the local. For extra drama, roll a fifth d30. On an even, proceed as normal. On an odd, replace the second party entry with "you". It could get downright Shakespearean fast.